Persecution | Something should go here, maybe later. 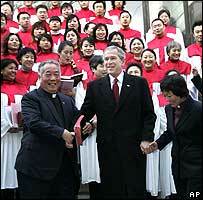 The Chinese government is not letting the Olympics, or the presence of President Bush get in the way of their ongoing persecution of the Chinese church. This morning, Brother Hua Huiqi successfully got rid of the police placed on his surveillance and met with his brother Hua Huilin. Then, they rode bikes and were bound for Kuanjie Church. At a place about 1.5 kilometers from the church, they were arrested by the police.Ingenious arrangements are being made at TSPM’s Kuanjie Church established by the government to welcome the visit of US President Bush on August 10.High-ranking officials from the Public Security Bureau, Bureau of Security, Bureau of Religion and TSPM/China Christian Council met at Kuanjie Church established by the government and there, they made ingenious arrangements for the visit of US President Bush on August 10. Sued for Printing Bibles – in the USA! America has a big reputation for people suing for the most bizarre reasons. The intent of the publisher was to design a religious, sacred document to reflect an individual opinion or a group’s conclusion to cause “me or anyone who is a homosexual to endure verbal abuse, discrimination, episodes of hate, and physical violence … including murder,” Fowler wrote. The report also quoted District Court Judge Julian Abele Cook, Jr., who wrote that “[t]he Court has some very genuine concerns about the nature and efficacy of these claims.” However, the report did not give any quotes from representatives of either Zondervan or Thomas Nelson. This one-sided reporting on the part of the Grand Rapids Press might lead one to conclude that the editors there must not see this as a frivolous lawsuit. You’d never guess that religious freedom was guaranteed by the American constitution. For some reason this makes me think of Lucyna’s post where protesters call the Pope’s beliefs “right-wing propaganda“. I guess both cases those opposing Christians in both cases have let their hatred override any sense of proportion or logic. Not that uncommon sadly.